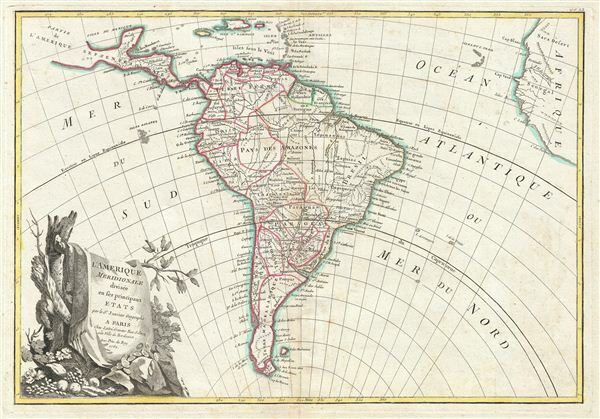 A beautiful example of Jan Janvier's 1762 decorative map of South America. Covers from the island of Hispaniola and the Yucatan south to Tierra del Fuego and Cape Horn, east to Africa, and west to Mexico. Details the whole of the South American continent showing mountains, rivers, national boundaries, cities, regions, and tribes. Identifies the mythical Laguna de Xarayes, supposed gateway to paradise or el Dorado, as the northern terminus of the Paraguay River. Also erroneously links the Amazon and Orinoco Rivers. As this map was drawn most of South America was dominated by the vast and increasingly mismanaged Spanish empire. Only Portuguese Brazil and Spanish and Dutch enclaves in Guyana, disrupted the Spain's continental hegemony. All three empires were aggressively exploiting the continent, with the mountainous western regions being rapaciously mined to supply China and europe's desperate need for silver to stabilize their economies, and the coastal lowlands dominated by sprawling sugar plantations intended to satisfy europe's increasingly insatiable sweet tooth. Meanwhile, much of the interior, in particular the Amazon and Orinoco basins remained largely unexplored. A large decorative title cartouche appears in the lower left quadrant. Drawn by J. Janvier c. 1762 for issue as plate no. 33 in Jean Lattre's 1783 final issue of the Atlas Moderne. Very good condition. Original centerfold. Blank on verso. Platemark visible. Minor foxing.